Batman arrives to save the day along with Red Hood, Artemis and Bizarro. A shocked Circe is stunned to discover Batman used his ingenuity to overcome her magic and as all hell breaks loose Batman uses his secret to free Deadman, Zatanna, Wonder Woman and Superman from the bewitching. Her trickery exposed, Circe still fights hard with her minions but the heroes win the day. The win is not without a caveat as one reluctant ally loses his life. Is everything as it seems? It is New Year's Eve and Wayne Enterprises is holding a huge party in Times Square. Batman is otherwise engaged with the cult group Kobra. Deadshot is nearby and joins in the chase but the Kobras up the ante with mutation pills that make them into huge reptilian beasts. 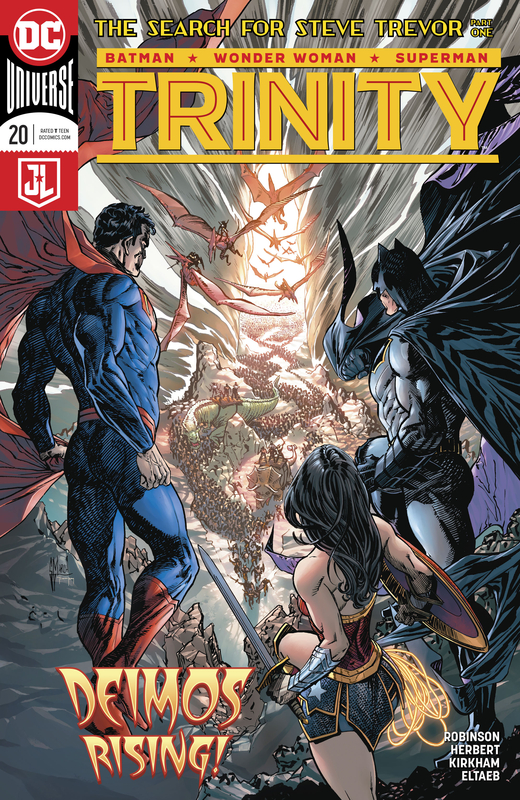 Superman and Wonder Woman arrive to assist and are taken aback that Bruce would join forces with a hired killer. 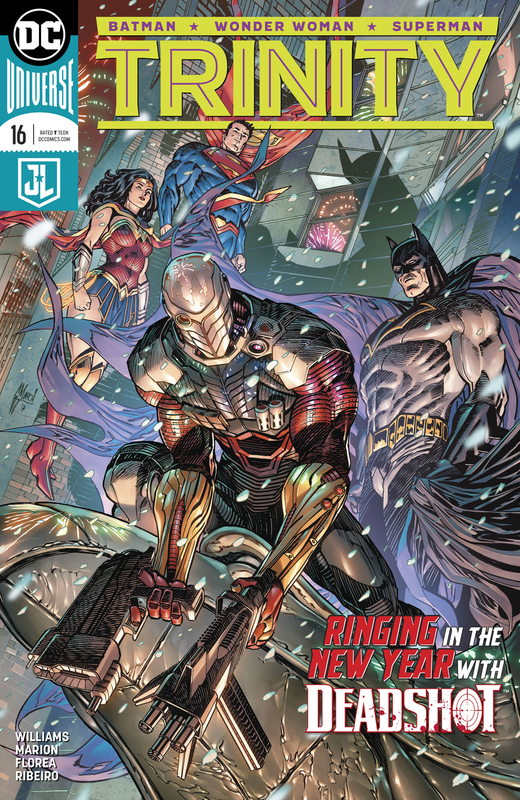 Deadshot reveals that Kobra have kidnapped his daughter and he's only been granted freedom from Waller's custody to rescue her. Kobra it turns out have decided that the Wayne Enterprises party should go out with a bang and their leader plans to detonate a quantum bomb, which is so powerful it could kill even the Trinity. Despite their distrust in him, Deadshot lands a head shot saving everyone. Batman and Deadshot come to the realization that Zoe was never anywhere near the party. Where could she be and what will be Lawton's fate? Bruce, Diana and Clark share moments of reflection and it is clear that Diana is missing home. 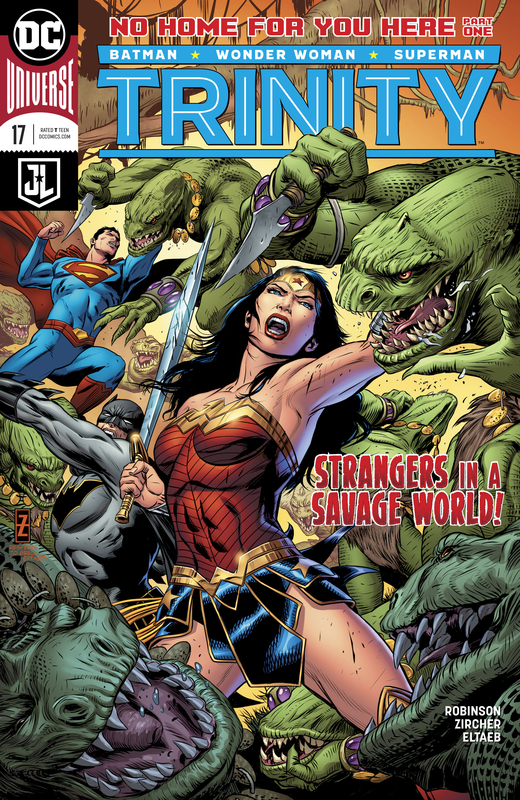 The two men realize that they have been neglecting the Amazon and vow to help her locate Themyscira. The three heroes head to the rough location but instead of the legendary island they discover a giant whirlpool and realize it is a portal. A small boat is being sucked into the portal so the heroes race to save it and any passengers that may be in peril. The vacuum proves too strong and Superman, Batman and Wonder Woman find themselves pulled to a strange new world. They each have a hinderance, Batman's plane and gadgets were lost in the journey and have left him uneasy in a world governed by magic. Superman has lost his abilities and Wonder Woman is blind. They decide to explore and discover an aircraft from the Vietnam War covered in foliage. 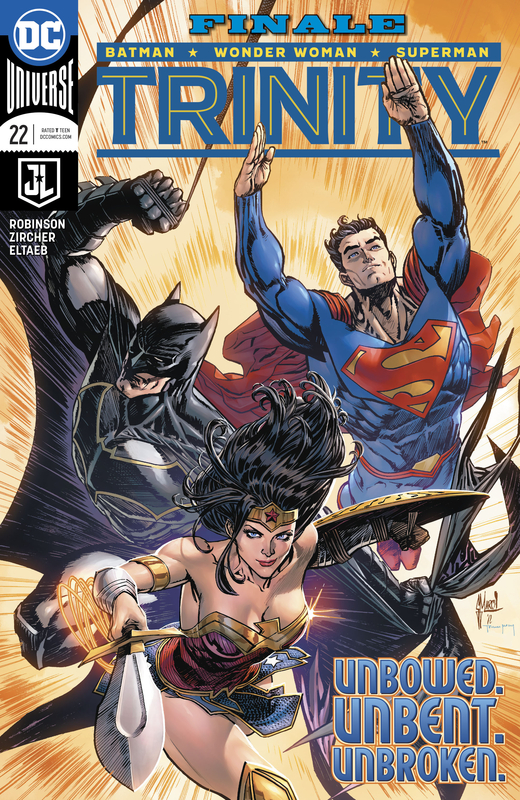 The Trinity are immediately put to the test when they are attacked. Wonder Woman may be blind but she is far from defenseless and using her knowledge she realizes where they are and that the pilot may be their only way out. Who is he and, with their hindered abilities to protect themselves, will they make it back to their own world alive? Warlord reveals he is an astral projection cast by witchcraft to enlist the aid of the fabled Trinity in a battle with Deimos to save Skartaris. Unfortunately the tolls of such a projection mean he is of little to no help as Deimos' forces attack Superman, Batman and Wonder Woman. With each having their skills severely hindered, they look to one another for inspiration on survival. Superman taps into Batman's determination, Wonder Woman on Superman's concentration and Batman into Wonder Woman's will. The monsters that attacked them revert to their original forms and Batman is stunned to discover elderly men, all sporting dog tags with a bird symbol. Warlord's daughter appears in another astral projection and reveals her father is dead and that she needs their help now more than ever. Superman ponders possible trickery but Jennifer Morgan reveals to them that time doesn't follow the same rules in Skartaris and that they must hurry to rendezvous with him in person in Shamballah, their capital. The heroes discover grazing unicorns and use them to cover ground faster but encounter wave after wave of Deimos' magical army. 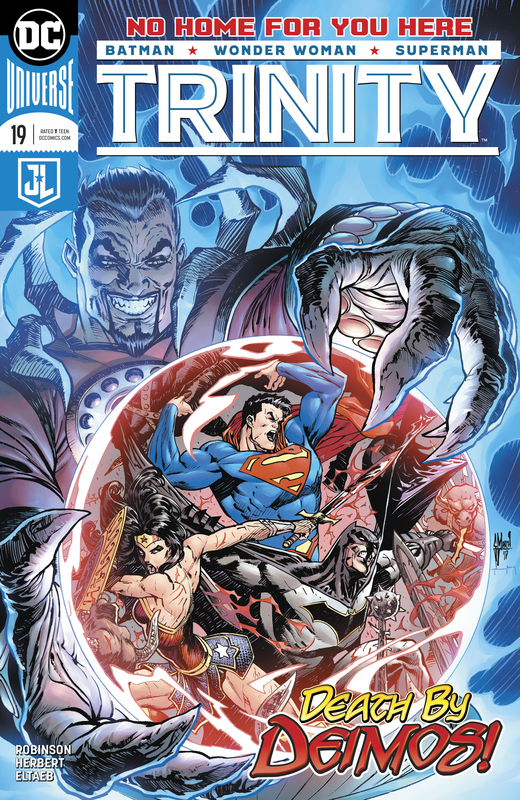 However the toll of time has a heavy price and even as the Trinity finally catch up to the sorceress, it may be too late for Skartaris, Diana, Clark and Bruce. Batman, Superman and Wonder Woman are talking about their recent trip to Skartaris and the secrets of the island lost in time. Their friend Steve Trevor is determined to discover what exactly transpired and the heroes look back trying to clear things up. Jennifer casts a spell that restores Diana, Bruce and Clark to their normal ages, it cures Diana's blindness and gives Superman a temporary magical barrier so they can fight the evil of Deimos. Warlord's daughter tells them about the lands Atlantean links but still refuses to reveal the secret of the modern soldiers that died in Skartaris. 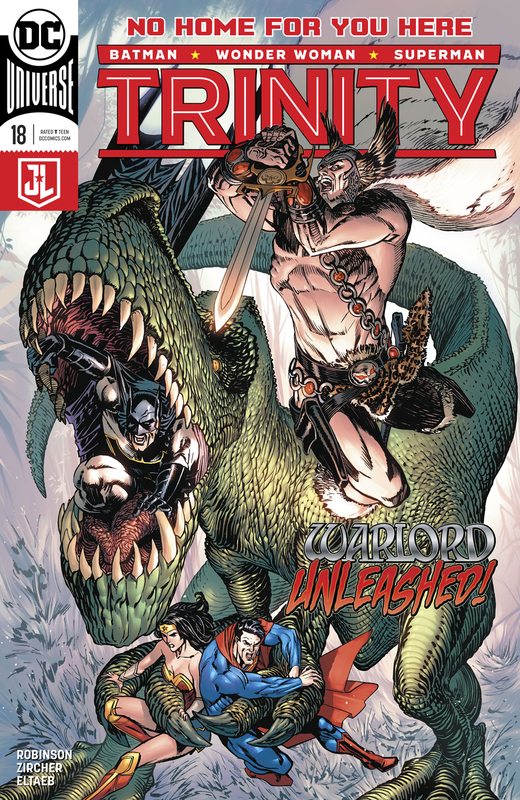 The Trinity race to save the capital and as the tide turns in the favor of good, Warlord reappears and reveals he and his daughter had crafted a ruse to trick Deimos and save the cities secrets from evil. Having defeated the villains the Morgan's sent the Trinity back to the modern world. As the story ends Steve Trevor is angry that the secrets of Skartaris are lost to him. 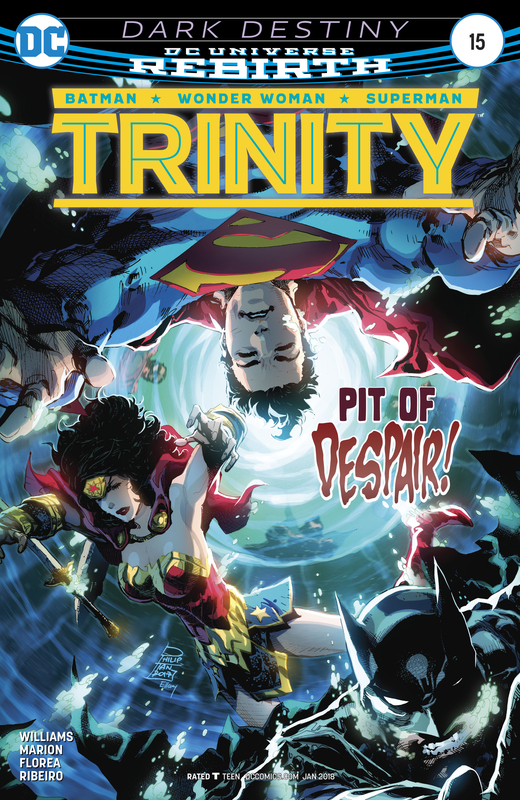 The Trinity reveal they have known all along that they were victims of deception and Superman swears to stop at nothing to put an end to this trap. To get to the Trinity, the sorcerer Deimos tricks Steve Trevor to Papua, New Guinea and transforms him with an evil enchantment. Meanwhile Batman has discovered the mysterious firm, Blue Strike Security, has links to their search but it has three sites to investigate: Dallas, the Egyptian desert, and deep space. 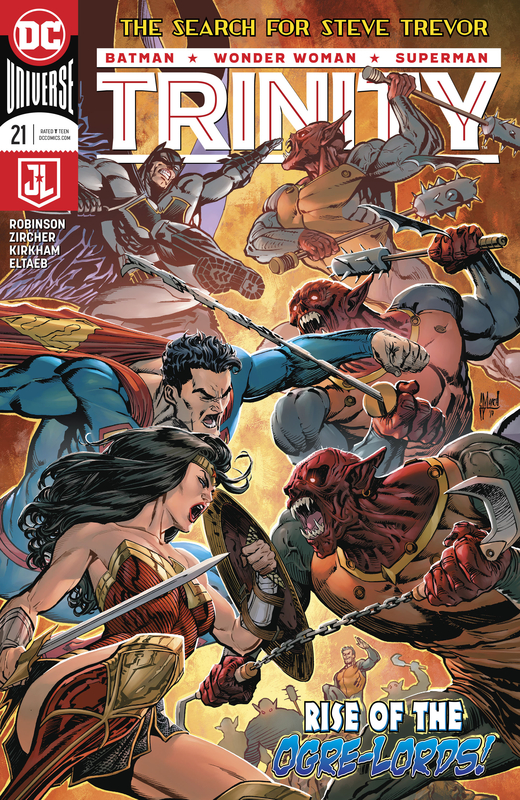 Superman discovers a satellite swarming with synthetic kryptonite wasps, Wonder Woman is ambushed by a giant robotic copy of the God Set and Batman has to battle a trio of android gorillas. The Trinity is thrust into battle and find they have to conquer both technology and magic to find a solid lead on Steve's location. They discover some strange coding and reconvening, Bruce is able to decipher them as coordinates to Papua, New Guinea. The search could be over, Steve reveals himself to his friends but he isn't the man they remember. He could be the death of them. Batman recalls an early mission against the Monster Men and how he subdued them as the beastial forces of Deimos attack the Trinity. Knowing they're up against humans from the Blue Strike security group and Steve Trevor makes it hard for the heroes to fight back. Using Batman's drug pellets they incapacitate their foes and resume their hunt for the evil sorcerer. After a series of flashbacks to Warlord's world the heroes realize they need to combine their abilities to battle Deimos and break his spell. The heroes discover a strange sanctum of mystical objects and a startling magical revelation that reveals how out of their depth they really are. Is Deimos the foe that will be the death of them?